One thing that bugged me about some of the comments from the Cascadia Calm post was the treatment of some regional personalities as normal, while others abnormal. But, Kim brings up Southern Charm indirectly, so I'll take a look at Southern Charm. The idea behind Southern Charm as the polite normal is pretty straight forward. As Kim points out, Southerners (especially Dixie Southerners) introduce themselves, use terms like sir and ma'am, make polite conversation and share stories about their lives, relations and friends. Now, if someone (without a Southern accent) came up to me and started behaving this way, I'd be just a bit put off. But, that's me, that's my region, that's how we see politeness. In A History of the South, Francis Butler Simkins and Charles Pierce Roland say “the cult of Southern hospitality” expressed “a means of relieving the loneliness of those living far from each other.” A new friend once pressed hospitality on me on Malta, the island at the belly button of the Mediterranean. When I suggested I could not possibly be as welcome a guest as he made me seem, he explained: “We live on an island. We wait for people like you.” Loneliness powerfully motivates hospitality. On a more basic level, when it took half a day to get to the neighbors, you’d better get more than a ladle of water and a nod from the porch when you rode up. Large farms, a largely rural population spread across several states. It is no wonder that the regional personality was focused on being so damn polite. If you weren't if you lost a few friends, they were likely the only friends you'd have a chance to make in awhile. The more we descend towards the South, the less active does the business of the township or parish become; the number of magistrates, of functions, and of rights decreases; the population exercises a less immediate influence on affairs; town meetings are less frequent, and the subjects of debate less numerous. The power of the elected magistrate is augmented and that of the elector diminished, whilst the public spirit of the local communities is less awakened and less influential. The map shows you that the De Tocqueville quote carries through to today. The institutions built up by citizens acting in concert with each other simply don't exist in the same ways that they exist elsewhere (especially New England, the upper Midwest and Cascadia). 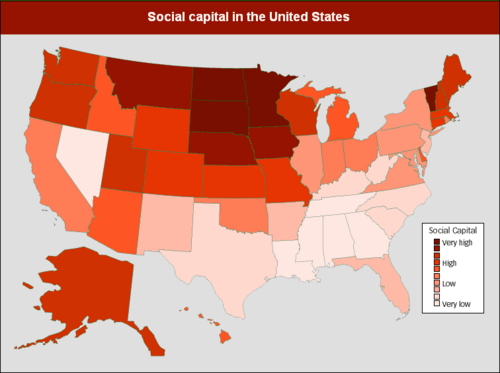 If you don't think about it too hard, it seems strange that the region best known for its social graces rates the lowest in social capital, the actual verifiable ties that bind community's together. Unless you thought that social politeness was a cover for actual social ties that bind. If you know you have support from your community, that things will go well because people are generally nice and will back you up, that your local government is there to help, I don't think you'll need to be overlly polite to everyone you meet. But, if you lack social cohesion, the support groups and social capital just isn't there, you're region might develop an overly polite personality to make up for it. 1. If You're Daily Hour With Me goes the fair, one must link to that. 2. Our own Steven L writes about some new exposure in Tumwater. 3. Flatwin is out with a new product. 4. Did you know Olympia is a vegan friendly city? As a matter of fact, no. But, I would have assumed. On the Cascadian Calm post, there are a handful of comments worth responding to. Here's my first shot, which is mostly just a bunch of adding and subtracting. ...people are becoming aware of the "Seattle Freeze", and as out-of-towners slowly take over the NW area. There are far more transplanted people here in the Seattle area than ever before. We're not going away, Seattleites. Time to embrace the change/different people and see that as a positive thing that makes your life richer! We all have gifts and bring different things to share, after all. So, the claim is that all the outsiders coming in will eventually overwhelm natives (and people that have acclimated) to make us more open to your Southern charmy or otherwise not Cascadian Calm ways. But, the number just don't add up. Second, the same sort of graph, but for Oregon, a state of about four million. Certainly there have been eras of massive migration into both states. The 90s were very good to us in terms of getting new people here. But, The chart overall is pretty volatile and in the last few years in Washington have been some of the worst for migrants compared to natural births. I'll refer you back to the general population numbers. Even in the days of 50,000 plus migrants a year coming into Washington, they were hardly a drop in the bucket compared to our overall population. You may come here, but in terms of you getting together with your migrant friends and changing our culture? The numbers just don't add up. Let's get back to one of my points in the original post, that the so-called Seattle Freeze (Cascadian Calm) is really a eye of the immigrant sort of thing. It really only exists in the eye of the new comer. That you start to see references to the Freeze in the 1990s (when post Boeing Bust migration peaked) certainly backs this up. Also, Kim's point about "embracing change" is well heard. We do embrace change, we are (along with Georgia) one of the most open regions, personality wise. We just don't get all up in your face about it. Why is it all named Puget Sound? Thus by our joint efforts, we had completely explored every turning of this extensive inlet; and to commemorate Mr. Puget's exertions, the south extremity of it I named Puget's Sound. Because Olympia, or rather what today we consider the suburbs of Olympia was first in western Washington, we call the entire inland sea in our region "Puget Sound." Originally, at least at its naming, Puget Sound only stretched as far north as the Tacoma Narrows. At that point, the water bodies took on other names such as Admiralty Inlet. If the first non-Indian settlements might have been further north, we might be talking about Admiralty Inlet rather than Puget Sound. It is likely that Vancouver himself thought the honor he gave to the British Admiralty more significant than naming a minor arm of the major water body after one of his officers. But, the British Puget Sound Agricultural Company came about 40 years later and at Nisqually, settled on the shores of the contemporary and modern Puget Sound. When the Americans came, all bets were off. 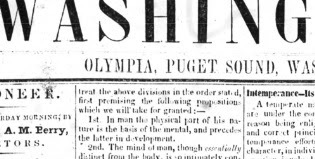 The second newspaper in what would become the territorial capital blatantly advertised itself as being "on" Puget Sound. So, as American communities began to stretch north away from Oregon and Olympia, they move the Puget Sound name north with them, erasing past distinctions. These settlements... were near the southern extremity of this inland sea -- the very portion which Vancouver named Puget's Sound. That name became the familiar one, ans as the white settlements moved northward along the shores that name carried along regardless of other names, like Admiralty Inlet, Port Gardner, the Gulf of Georgia and Strait of Juan De Fuca. Puget Sound became the generic name for the whole region and is largely so used in the present time. Port Gardner was named for a British vice-admiral and Vancouver's patron and the Gulf of Georgia was for King George III. Both seem to outrank Lt. Peter Puget, hardworker he may be. It wasn't until 1919 that the name Puget Sound for the entire body of water from the Pacific inland was officially named Puget Sound. For the South, there's a very and bright line clear line of when the era following the Civil War ended. Unfortunately for me, it is when the Alabama Crimson Tide beat the University of Washington Huskies in the 1926 Rose Bowl. It was more than a football game. It was the chance to avenge the South, to reclaim the valor and honor of the Lost Cause. No longer would this land be known for its hookworm and illiteracy. It would be the home of the best damn football in the nation! "The 1926 Rose Bowl was without a doubt the most important game before or since in Southern football history," says Birmingham News sportswriter Clyde Bolton. The 1926 Rose Bowl was a regionally defining event for Dixie (if not the broader south). It showed a way back to regional pride. And, no one can argue that college football is still very much top dog in terms of major sports in Dixie. So, was there and equal reaction in Cascadia, turning us back when the South lurched foward? Taking a simple look at our history, it seems that the Husky's performances in Rose Bowls does seem to correlate with the region's economic well-being. The 1926 Rose Bowl in fact marked the high mark of the region since Washington statehood and the recession that followed. Since the 1890s, Cascadia had slowly begun transforming itself from frontier to a real region. As the city matured, it sought to make further refinements to itself, thus launching a campaign of civic improvement devoted to mastering nature locally as well. One set of improvements revolved around leveling the steep hills that encircled the downtown. Between 1900 and 1930 the city re-engineered its natural setting by regrading the slopes around the central business district. The hills were seen as an impediment to real estate development; city officials assumed that by lowering the hills they would facilitate the outward growth of the central business district and accelerate the rise in property values. As workmen washed and shoveled and hauled the hills away, they also straightened the lower Duwamish River in order to facilitate shipping on that stream; created Harbor Island, which added to the city's waterfront; and filled in some of the tideflats in the area just south of Pioneer Square (the spot occupied by the Kingdome between 1976 and 1999). But, following the 1926 Rose Bowl (not immediately after, but soon) all that came to a crashing halt. The economic depression through the 1930s dragged the entire country down, but it hurt Cascadia even more than the national average. Unemployment in our region was far above the national average throughout the depression. Investment stopped and the growth that our region had expected halted. By 1933, lumber exports stood at about half what they had been in 1929. Many agricultural products brought prices so low that they were not worth shipping to market; some apple and prune growers uprooted their trees and burned them for fuel. Mining output in Idaho dropped from $32 million in 1929 to $9 million in 1933. By 1933 income levels across the three states had declined to about 55% of what they had been four years earlier. Rates of tax delinquency and business failure, of course, had climbed greatly. The surest sign of an interruption in the normal course of things was that, for the first time since the 1840s, mainstream society was united in trying to discourage migration to the region from back east—for fear that newcomers would only add to already overburdened welfare rolls. In fact, the population of the area did not stop growing during the 1930s; it actually increased by about 10%, largely because so many people from the Midwest moved to the region seeking work. But, unlike Dixie, Cascadia didn't see the Rose Bowl in terms of regional identity. The Seattle Times coverage on January 2, 1926 was typical of a losing city. A few paragraphs on the front page and then full page coverage in the sports section. While the Crimson Tide were being great by brass bands and crowds on their train trip home through Dixie, the Huskies were greeted with shrugs and "I guess we'll get'em next year fellas" attitude. And, it didn't seem that unrealistic that the Huskies would be back soon. They tied Navy two years earlier in their first visit to the bowl game and had won conference titles twice more in ten years. But, as Cascadia entered the Depression, the Huskies would have a long road back to the Rose Bowl. Their coach in 1926, Enoch Bagshaw resigned after a losing season in 1929 and died the following fall. Huskies would lose in 1937 and 1944 without scoring a point. In fact, the next (and scoring at all) in the Rose Bowl for the University of Washington would be in 1960 when the fate of Puget Sound and broader Cascadia seemed bright again. The Huskies would face off against Wisconsin and beat them 44 to 8. Later that summer, the Seattle World's Fair was announced. The Huskies would repeat in the Rose Bowl, beating Minnesota this time 44 to 8. When the fair was held in 1962 it crystallized the hope and audacity of the region that had dragged itself back from the depths of the Depression. By 1964, the Huskies were back to losing the game and entering a 14 year Rose Bowl drought. In the middle of that Rose Bowl desert, the Boeing Bust hit Puget Sound, taking the spirit of the 1962 World's Fair with it. The Huskies returns to the Rose Bowl from 1978 through 1982 buck my nice neat trend. The Huskies were 2-1 in these years, but Cascadia and Puget Sound were going through some roller coaster years. The economy in the late 70s was pretty good, but had dropped off by the time the Huskies beat Iowa in 1982. In the early 1990s, the Huskies again went 2-1 in Rose Bowls, winning a national championship and finishing undefeated in 1992 against Michigan. This game could very well mark the high point in Husky football history and the high mark of Cascadia's economy and cultural influence. While the Huskies were making their way through national football powers, Grunge was happening, Seattle was becoming the most livable city. Yes, Cascadia changed in the 1990s and the Huskies were there in Pasadena. 1. Did Steamboat Island exist? I think we got it sussed out. 2. This was one of my favorite things the last few weeks. Newspaper asks why one thing can't be true in an editorial and then says it is true in another item in the same edition. Same day media criticism! 3. Evergreen Problems has inconsistently been one of the funniest twitter things in town. Since they're back being funny (but only in bursts) this tweet was pretty on the spot. 4. A really good artists blogs about the buildings around town he's drawn. 5. And, lastly, Mojourner is (usually) right, it is the watershed. A few weeks ago, I wrote a post trying to connect how Appalachian and New England settlers have shaped Cascadia. I used a map to shortly show how some things (like legalizing marijuana) cuts across the usual political barriers in at least one part of Cascadia, Washington State. Muto_krang on a reddit thread about the post questioned the conclusion I'd drawn, so I'll try to explain it a bit better here. This is the 2012 governor's race. 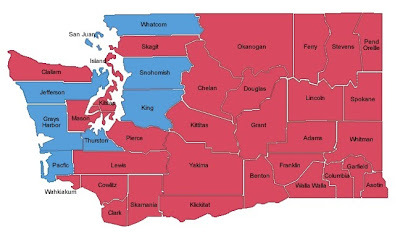 Most of the territory is red (Republican) except for the Puget Sound, where most people in the state live. You see the same pattern in the 2008 governor's race and the 2010 senate race. Democrats win the urbanized Puget Sound and some traditional Democratic holdouts on the coast. Republicans win the rest. But, this is only when the race follows traditional (and typically national) lines of debate. Republican and Democratic candidates in Washington typically discuss things like taxes and abortion, things that the different parties argue about everywhere. You still have the traditional liberal base of Puget Sound voting to legalize marijuana, as you would expect. 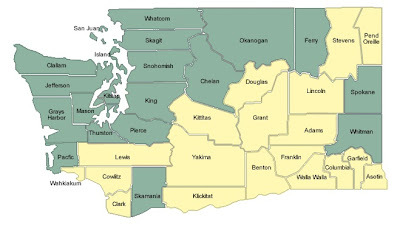 Even borderline liberal counties like Pierce County join in. But then the political spectrum loops all the way around and the libertarian (from our Appalachian roots) comes around and holds hands. Places like Ferry, Skamania and Clallam counties (which don't often vote for Democratic candidates) each voted the saem way King and Thurston County. So, that is what I meant when I said " In (Cascadia) you find a drastic description of how the two divergent cultures come up with consistent political philosophy." In this case, when you ask the question that neither party is asking (should we legalize marijuana) you find a geographically diverse majority in favor of it. My next question is, what are these legalizing marijuana like questions that we aren't asking that can be answered with a Cascadian political philosophy? If you take a close look, the early 1970s seemed to be the high-water mark for competitive club soccer in Olympia. The Olympia Vikings and the Olympia Olys both played in the top division of the State Soccer League. Both also competed in what we now call the U.S. Open Cup (then called the National Challenge Cup). Quick break here, but the "Olympia Olys" is just about the most awesome team name ever. I wish someone would do a modern logo for that team. I'd buy a t-shirt. The 1972 Olympia Vikings were the first Thurston County team to compete in the national cup and quickly dropped out when they were beaten 6-1 in a Bay Area, California game against the "Concordia Club." By the late 1970s, the State Soccer League died away. In the 1980s, in the wake of the death of the NASL (and the top division Seattle Sounders) FC Seattle and the Western Washington City League started up. I found a lot of soccer history of this era in a Seattle Times archive available from the Seattle Public Library. It is mostly back-of-the-sports-page sort of stuff and there's a lot in there. At some point, someone could go through the entire archive and pull out a pretty complete history. It was interesting to me that even though the Olympia clubs in this era made the Seattle paper, when I took a look if there was any coverage from Olympia newspapers, I didn't find any. Also, take a look at the Evergreen Premier League. This is a very recent effort to put together a sort of open (not summer collegiate) semi-pro league in western Washington. So far, they've gotten a lot of interest, including a nascent effort by our own Brandon Sparks to get something going. If you live in Olympia, go take a look at your ballot. Looks pretty empty. 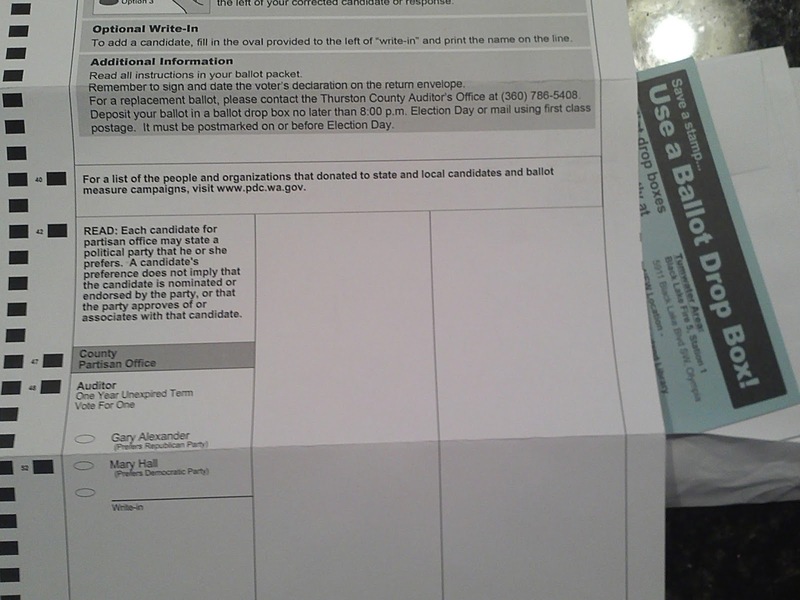 There's only one raced listed on this summer's primary ballot in Olympia and that is for county auditor. The interesting part is that it really isn't a primary election, in the traditional sense, since only two candidates appear on the ballot. If not for a change in state law (embodied in HB 1195) that went into effect two months ago, the ballot sitting in your kitchen wouldn't be there. The legislature only changed the law this last session that requires a primary in the case of an election to fill a local partisan office "of an unexpired term in an odd-numbered year if no more than two candidates have filed for the office." It makes perfect sense for there to be no primary if only two candidates are on the ballot, right? Well, not really, at least from the perspective of the legislature. It is worth noting here that the election in this case, county auditor, is for the office that is responsible for executing the very law I'm writing about. It is also worth noting that one candidate for county auditor (Republican Gary Alexander) serves in the legislature and on the committee in which this bill was originally considered. He voted against the bill to make this change when it was in committee, but voted for it when it was in the full house. So anyway, why require a primary when it is essentially meaningless? Both candidates will be in the general election in November anyway, so why waste the money printing and counting ballots? The way state election financing rules are written, candidates can raise separate amounts for primary and general elections. If you want to give money to a candidate, you're limited to $900 per election. But, primary and general elections are counted as sepereate, so in a typical race, you could give up to $1,8000. This exchange from a committee meeting gives you a good idea of the context of this kind of law. Rep. Manweller: Could they raise two checks or would they be limited to just one? Legislative staff: Under the current system (no primary needed) they would be limited to half, one $900 check, or whatever that is. Manweller: So they would only have one election. Staff: That's right. Under current law, under these circumstances. If the bill is changed, then they would have two elections. So, essentially, the only reason for the change in the law that's forcing Thurston County to print, mail and count extra meaningless ballots is so candidates can raise more money.